Mental health disorders and emotional distress are as debilitating and agonizing as physical health problems. According to the World Health Organization, mental health disorders are the fourth leading cause of ill health in Iraqis over the age of 5 years. There is little doubt that years of political and social repression, punctuated by wars and followed by a post-war period characterized by interrupted and insufficient basic services, have taken their toll on the Iraqi people. Few people in Iraq have remained untouched by the trauma associated with years of unrest and instability. “I almost had a nervous breakdown. I hit everything that I see in my way. I get angry and hit things. I’m worried that my children will get sick. I witnessed an explosion four years ago and I still have shrapnel in my head from the incident. Six years ago I was imprisoned in Abu Ghraib for a year and a half. I became an angry person, I would get irritated so easily and always felt miserable. After the first session of counseling I felt that I had been helped. The problem is I’m always worried about the cost of living since I don’t have enough money . . . and I’m always afraid and worried that something bad could happen to my family”. 47-year-old male, married with 10 children. First session. Societies that have experienced years of suffering and social upheaval due to long periods of violent conflict not only face high levels of emotional distress, but have great need of a healthy, productive population to rebuild their country. However, as mental health problems are often less visible than physical ill health, and often less understood by most in the community, mental health care is frequently significantly less resourced than physical health care. 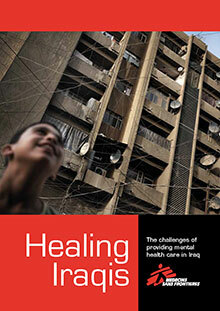 In 2009, Doctors Without Borders/Médecins Sans Frontières (MSF), in collaboration with the Iraqi Ministry of Health (IMoH), launched a program aimed at opening up access to psychological counseling, and at catalyzing the integration of mental health care as a crucial component of the Iraqi health system. The project focused on nonpharmaceutical approaches to address the anxiety and depressive disorders, which research shows are the most common of the mental health disorders experienced by the Iraqi population, and which are considered highly amenable to psychological counseling approaches. Over the past four years, MSF and the IMoH have introduced psychological counseling services in two hospitals in Baghdad and one in Fallujah. The intention is for the model of care to be replicated in other health care facilities throughout Iraq and, particularly, consistent with current worldwide approaches to mental health care, to integrate psychological counseling into community-based primary health care services. As in many countries with under-developed mental health care services there is also an urgent need to increase public awareness of mental health issues and encourage those in need of care to seek assistance. Raising awareness can also help reduce the stigma associated with mental health disorders by the public, other medical professions, and at the political level. “I came here for the first time to overcome the situation I’m in. I always have negative thoughts and when anyone starts talking to me I suddenly can’t stop crying. I witnessed several explosions go off in front of my house and have had my homes searched by the police several times. These experiences affected my life and my work so much. I tried to talk to my family, but they didn’t understand me and didn’t listen to me. They say I’m crazy. That’s why I came here; I want someone to listen to me. I left my work and now I’m a housewife, I don’t like socializing with the family at all.” 27-year-old female, married, housewife. First session. The Iraqi MoH is committed to addressing the issue on a broad scale, but much more work needs to be done to improve and replicate services, increase community awareness about services, and reduce the stigma associated with mental health.